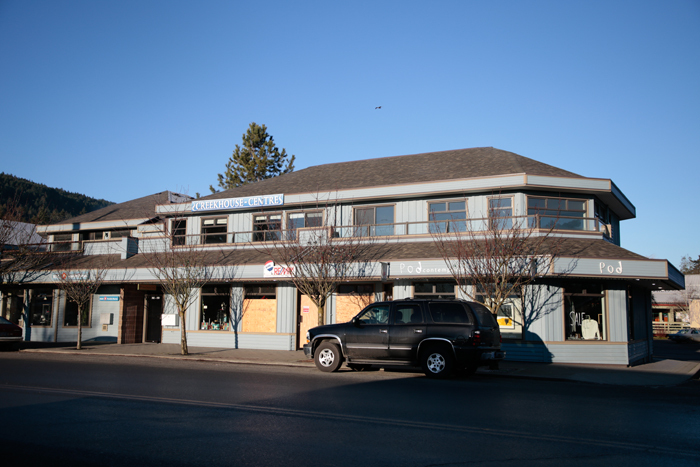 Creekhouse building in downtown Ganges, where the owners want to add a suite for a caretaker to help deter vandalism. An application to add a caretaker suite to the Creekhouse building in Ganges was turned down by the North Salt Spring Waterworks District board because it goes against the district’s moratorium policy. The suite was planned for the building to house an onsite caretaker whose job would include ensuring the building was kept safe and to deter vandalism. Multiple incidents of vandalism have occurred on the property. The Pender Island company purchased the Creekhouse building last year and planned to install water-conserving fixtures throughout the building to make up for the added water use a suite would bring. Murdoch and company owner Davie Rae presented their case to the water district board at the January meeting, but the board determined that the application was a violation of the moratorium as it would be considered a secondary suite. Although the addition would use less water than the building already does, the district determined that the water usage did not factor into their decision. The moratorium policy applies to the service connections, not the actual use of the water once it is past the meter. “We’re limiting increases to demand on our system because there have been numerous reports done that show that we just don’t have the capacity,” district manager Ron Stepaniuk said during the meeting. Plans for the Creekhouse building are based on the Driftwood Centre on Pender Island. LED lighting has already been installed outside to deter vandalism, and further lighting is planned for the parking lot behind the building. Other improvements will include fixing up the nearby planters. This was not the first such application after the moratorium was put in place. An application for a caretaker suite was made by Martin Ogilvie in 2015, which was denied because the new residential use represented a substantial increase in demand. The property is served by a three-quarter-inch pipe and part of the moratorium policy includes denying any increase in connection size. A second similar situation was that of the Harbour House Hotel, which proposed renovations that increased the number of rooms in the hotel but reduced the water usage. This property had a larger connection, and it was determined that the changes could be made without reducing the size of the service connection. Trustees sympathized with the Creekhouse applicants, but the moratorium policy was upheld. Trustee Michael McAllister said that the organization needed to review how they incentivized water conservation, and potentially a refinement to the moratorium.